The 12,500 tonne ship, which has served the Island for 16 years, went into dry dock at the end of April for her regular biennial ‘service’. The work at Cammell Laird shipyard included a technical overhaul as well as refurbishment of the passenger and crew areas. Southampton-based marine interior refurbishment specialists Trimline have refitted and revitalised a number of areas on board. Work to the public areas includes a new layout in the Café bar, including extra banquette seating, tables, tub chairs and walkway layout, new carpets and Amtico planks. In the main lounge, new carpets and flooring have been installed, seats have been re-upholstered, artwork and signage updated, table tops replaced and new LED lighting has been installed. Trimline has also reconfigured bulk head lights and installed new deck heads, as well as refurbishing crew areas. All work is on schedule, allowing Ben-my-Chree to return to service in plenty of time before the TT. While the vessel was in dry dock, freight duties were carried out by MV Arrow, which the Steam Packet Company has secured on a long-term charter, while Manannan has looked after passenger services. 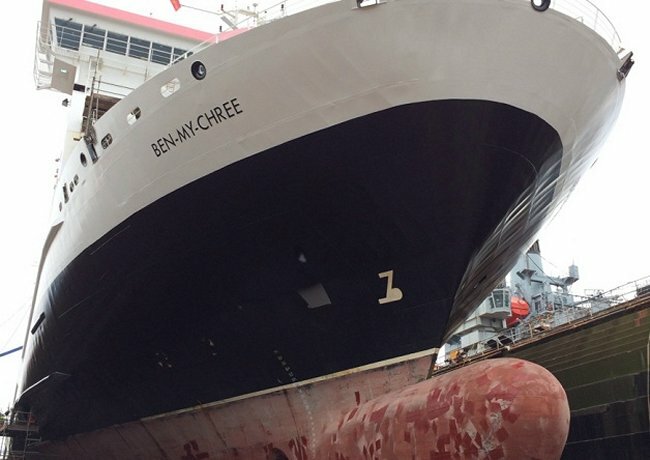 ‘Ben-my-Chree undergoes a technical overhaul every two years and this year we have taken the opportunity to also enhance facilities for both passengers and crew.